RiP: A Remix Manifesto (2009) is a documentary made by Canadian filmmaker Brett Gaylor about the inherent injustices associated with copyright. The film is particularly focused on the work of remix recording entertainers, who creatively remix lots of existing, copyrighted songs in order to create their own music. In such cases there is no original music recorded; the output of the remixer is a mixture and comprises multiple overlays of existing pieces of music (i.e. a mashup). Has the mashup artist created something new? Yes, he has, and that is what this film is all about. Actually, the film production is something of a self-reference to its content, because Gaylor has enlisted hundreds of people to collect existing film footage in order to make a mashup out of his own film. At the end of the film, he announces that RiP is an open-source documentary, and he urges others to take his film and modify it as they choose. The film is basically made up of two intermixed (and remixed) parts. One part focuses on the life and work of remix/DJ artist “Girl Talk”, who in real life is Greg Gillis and who until recently had a day job as a biomedical engineer. 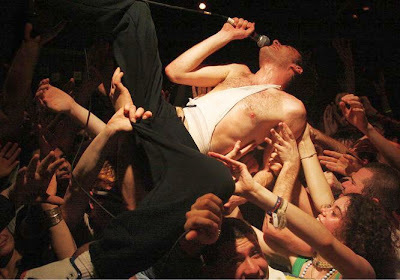 Girl Talk takes without authorization and remixes sometimes a dozen songs in order to produce one of his mashups, which he “performs” in public as a gyrating DJ. By means of a careful examination of how he makes his mashups, it is made clear in the film how remixers can take original pieces of music and electronically produce “compositions” that are strikingly different from the starting material. Note that your enjoyment of this part of the film will, of course, depend to a certain extent on the degree to which you are a fan of Girl Talk. 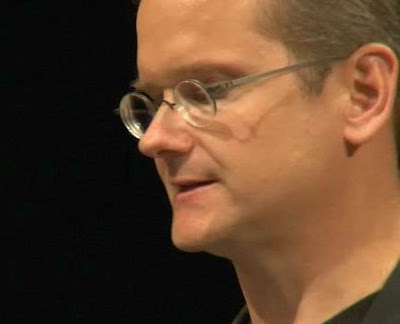 Lawrence Lessig is a Stanford law professor who established the Stanford Center for Internet and Society and is a well-known critic of the excesses of copyright. He is the founder of the non-profit organization, Creative Commons, and is the author of the book, The Future of Ideas, which is available for free download. Cory Doctorow is a well-known social networking blogger and critic as well as a science-fiction author. He is a prominent advocate of the liberalization of copyright laws. 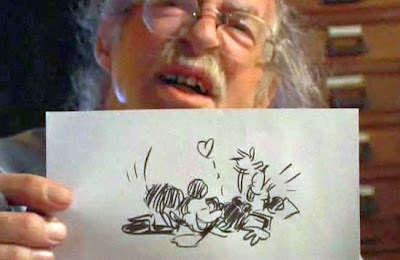 Dan O’Neill is an underground cartoonist who founded the Air Pirates whose depictions of cartoons looking like Mickey Mouse led to a lawsuit filed by the Disney Corporation that went on for nine years and cost millions of dollars in legal fees. In this connection the film exposes the duplicitous nature of Disney, which derived their cartoon characters from existing graphic representations of iconic fantasy figures. Moreover, O’Neill’s mouse was graphically similar to the original 1930s Mickey Mouse and therefore rather different from the graphical form that Mickey had in 1971, so O’Neill’s mouse representation was not even in competition with the Mickey of that time. Jammie Thomas is a single mother who was successfully sued by the Recording Industry Association of America (RIAA) for hundreds of thousands of dollars for downloading some songs from the Internet. Gilberto Gil, a famous Brazilian musician, was the Minister of Cultural Affairs, and has been a leader in promoting Brazil’s sponsorship of its world-leading open-source culture. To build free societies you must limit the control of the past. All of these elements are of interest, and they are interlaced with additional remix material that underscore the points made. But Gaylor’s sociocultural description is quite general and doesn't zero-in on the key issue here: intellectual property. In fact my only reservation about the film as a whole is that people like Lessig, and perhaps Doctorow, don’t really go far enough in their criticism of intellectual property. They seem to think that copyright is, at bottom, legitimate, but that current law has simply gone too far. But I hold that the very nature of intellectual property is fallacious and that there is no legitimate place in society for copyright or patents. We need to look for different solutions. reader/viewer: information is understood if the reader’s response is what the creator/sender more or less expects. Thus information is not just the map (which is often just the text), as “intellectual property” advocates assert; the map, itself, is useless without the other items that are part of the interaction. The map, alone, is typically just a sequence of characters, and the semantic interpretation depends on other components of the interaction. But since “intellectual property” advocates believe that information is effectively just a material entity, they attempt to justify intellectual property laws with the s ame two kinds of quite distinct arguments used to justify material property, in general: (1) moral arguments: we deserve to have exclusive possession over the fruits of our labor, and (2) utilitarian arguments: property ownership is useful for resolving custody disputes and for stimulating economic development. moral justification. It should be evident that intellectual property is in fact not truly attributable to an individual; it is inevitably a social product from a social context. Nobody invents something out of thin air. We all know that new ideas are built from existing ideas and experiences, so it is unsuitable to attribute the “creation” and ownership of an idea to a single person. utilitarian justification. Although there have been many studies made, the utilitarian value of intellectual property laws has never been demonstrated. Actually, only England (from 1710) and the United States (from 1790) even have much of a history with intellectual property laws. Much of the rest of Europe didn’t introduce intellectual property laws until the 20th century. So most of history the world has lived without such laws. The economic successes of the US and England were due to free trade, not restraints of trade. See Boldrine & Levine for more information. In fact the notion intellectual property is not only not helpful, it is genuinely harmful. Consider copyright, which concerns expression. Certainly nobody owns the English word, “the”. It follows the nobody should own any particular sequence of letters. To mandate such ownership constitutes an impairment of free speech. If I gain legal control over a collection of words, it doesn’t afford me any greater control over my own circumstances (I already have that); rather, it gives me control over you – I can prevent you from expressing yourself freely. Software patents represent a confused idea that cannot be enforced in a logical fashion. Patents were originally intended for inventions of new devices or of processes associated with them. The appropriate domain of patents has always been problematic, but with the advent of computers, that inherent pr oblem became intractable. This can be explained with the aid of the diagram at the right. General-purpose computers can emulate any kind of machine if they are given the right instructions (software). Once a given machine is emulated, further instructions can be given to operate that machine – or instructions can be provided to produce another virtual machine on top of the original one. 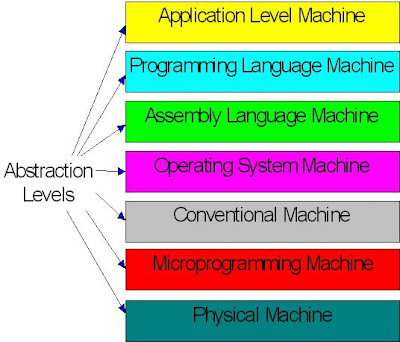 On most computers there are several such layers of virtual “machines” running software programs. In fact it has long been known that general-purpose computers can emulate any form of structured (logically expressible) thought. This means that if one allows software patents, one is opening the door to the patenting of all thought. All the structured ideas in your mind could ultimately “belong” to someone else. Not only is the idea absurd, it is not enforceable in a judicious manner. Just imagine if all mathematical theorems were patented and limited in their availability! Software patents inhibit new technical developments. The argument is made by some that patents stimulate inventions. In fact, the opposite is the case. We can be thankful that there were no software patents before about 1980, prior to which there were a great many discoveries made that are now freely available. Since then, however, there have been numerous software patents granted that impede progress in the field, including patents in such basic areas as font types, compression, and encryption. When such patents are granted, they stifle new developments. Currently, for example, the area of Voice of Internet Protocols (VOIP) communication is so cluttered with patents that technical advances will likely be impeded for the next 15 years. Software patents waste resources and contribute to the economic polarization of society. When patents are granted, considerable research effort is devoted to developing workaround solutions that strive to get around a patent blocking technical development. Large companies often take out patents in order to stifle their competitors or for use as bargaining chips in negotiations with other large companies. In such cases, valuable resources are wasted in the effort to avoid the suffocating effect of patent control. In addition, the existence of software patents has led to a wasteful increase in litigation associated with patent enforcement (enforcement, in fact, of an idea that is fundamentally unenforceable).This situation only contributes to an increasing economic polarization in capitalistic society. Microsoft, for example, has 10,000 U.S. patents, more than 17,000 U.S. patents pending, and more than 30,000 issued and pending international patents. Such patent collections are beyond the reach of ordinary companies and contribute to the kind of industrial concentration that has increasingly polarized the “globalized” society. The World Trade Organization is aggressively attempting to globalize strong intellectual property laws everywhere, so that large American organization can maintain control over the global marketplace. If intellectual property represents a faulty model, then what should be done? Ownership of things, such as books and DVDs, is OK, of course, and these can be suitably encrypted by the producer as they wish. Furthermore, purchase contracts associated with these items are legitimate, and more creative types of such contracts can be explored. But we are wasting effort and resources enforcing the bad model of “intellectual property” that information technology has now exposed as flawed. RiP: A Remix Manifesto raises some of these issues. Let us hope that as information technology continues to progress and more people see films like this, it will become increasingly evident to a larger portion of the public that something needs to be done to open up and ensure freedom of expression for everyone.